Bear, Greg. War Dogs. Orbit, 2014. Finally, a story about Mars that doesn't demand total suspension of disbelief! 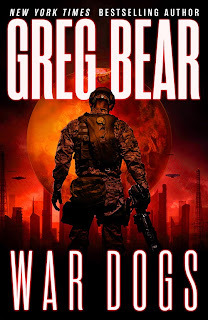 Bear has carefully crafted a tale that is both consistently entertaining to read, thanks to the snappy dialogue and descriptions, and yet also serious about exploring the practical difficulties that would ensue in a near-future interplanetary war. It's a scenario in which technology is much more advanced than today but not unrecognizably so, and logistical problems like supplying air, water and weapons to the "Skyrines" landing on Mars to fight the Bad Aliens on behalf of the mysterious Good Aliens have been taken seriously. It was a refreshing change to read a story that doesn't simply skip all that pesky logistics by concocting some pseudo-scientific, deus ex machina uber-tech solution (FTL drives! Ansibles! ), but instead delves into the nitty-gritty about how in seven hells one could possibly arrange to fight anywhere but on Earth. We follow a not-as-dumb-as-he-seems-but-still-kind-of-dumb protagonist, Michael Venn, through his adventures on Mars, which he narrates mostly in the historical present, but this chronological retelling is complicated by periodic cut-scenes, so to speak, to the true present, back on Earth, where he is trying to make sense of all that happened. I know this is a common literary device, and I further acknowledge that in the vast majority of stories the survival of the main character(s) is never seriously in doubt, but I still have qualms about it, since why remove all hint of suspense about the main character's ultimate fate? That said, I can't get on Bear's case too much, since I don't have the faintest idea how to tell the sort of tale he's telling in any other way but this suspense-less split-time approach or the plodding, 'chronological order' method. It is hard not to empathize with Venn and the other Skyrines as they land right in the middle of a planet-sized SNAFU, and as they (and we) spend the rest of the story trying to figure out what's gone wrong and why, and who they can trust (pretty much nobody, of course). 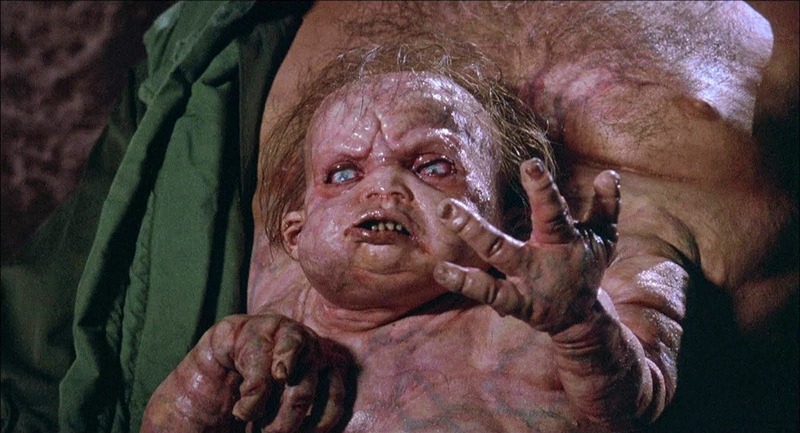 But while the story requires considerably less disbelief than most that deal with the Red Planet ("Quaaaaid...start the reactor—free Maaaars!" and whatnot), certain elements felt like false notes in an otherwise pleasant melody. Whatever other objections to War Dogs you might muster, at least it had no Weird Stuff As Hard To Believe As It Is Creepy! First off, is there any force in the universe that could convince people to stop saying Foxtrot Uniform Charlie Kilo (if you know what I mean)? And given all the advanced tech granted us Earthlings by the Gurus, and the importance of the Skyrines' mission to and on Mars, it seems unlikely, to say the least, that Venn would have made it back to Earth yet avoided being mobbed by the rich and powerful, and all by means of the simplest subterfuge regarding his identity. There were other false notes here and there, but I dare not say more since I am already teetering on the edge of blabbing about the Big Reveal. 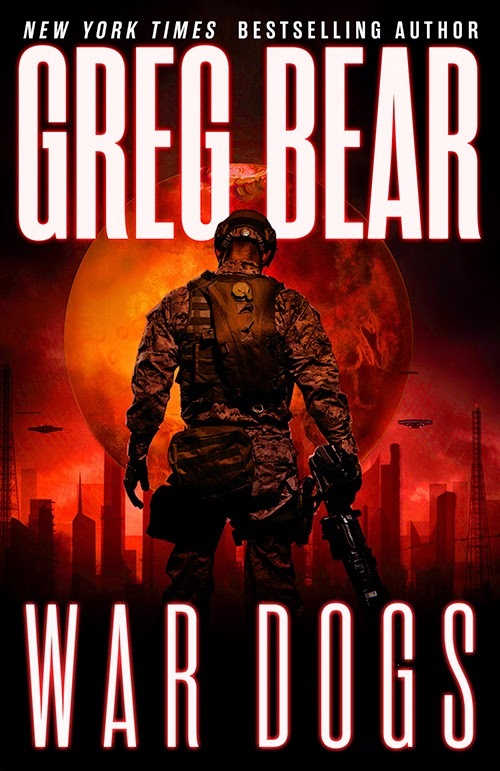 The ending to the book was surprisingly anticlimactic, even considering it's obviously intended to be only the first installment in a larger story arc/series, and I expected rather more from sci fi veteran Bear, who judging from his other work certainly knows how to close the deal story-wise. But Bear handled most aspects of this intriguing story very well indeed, and has, in me, a reader eager to devour subsequent books on Venn and his decidedly unusual life! 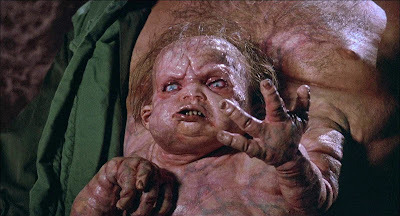 Zhaoyun, longtime connoisseur of the finest SF/F (plus, it must be admitted, a bunch of not the finest SF/F, e.g., I keep watching The 100 even though I know it's a steaming pile of crap), has provoked literally dozens of laughs, guffaws or energetic chuckles worldwide since beginning to write for Nerds of a Feather in 2013.